#iole15 | Virtual Environments: Is one life enough? We spent this class on site visits to the buildings chosen by each group. This gave us an opportunity to observe if voice is available and discuss how the presentations might best be made. Where voice is unavailable text would need to be prepared in advance: for example, prepared text could be pasted into local chat or notecards could be prepared for circulation. We also noted the footfall at each site. It might be disturbing if there are too many people in the vicinity so we suggested you give this some consideration – visit the site at the same time as class is usually held to ensure you know if it will be busy and to find a suitable location for the presentation. Write the ninth post: to your blog describing progress on your project. Students presented progress on their projects in this week’s class. Each group is well engaged in their work, having visited potential buildings around SL and selected one to work with. Students have made an effort to contact the owners of buildings with varying success. We discussed ways of finding out who to contact and how to go about establishing communication. Sometimes this is not as easy as it sounds – even if the avatar is standing in front of you as we discovered last week. John introduced the class to ‘notecards’ and demonstrated how to make a new notecard and share it with somebody, even when they are offline. This can be a useful way of explaining your interests and reason for making contact. A few comments on your blogs: most of you are not keeping up with the prescribed posts. You should all have written at least seven posts by now (as listed in the Activities for Next Class section of each class summary). 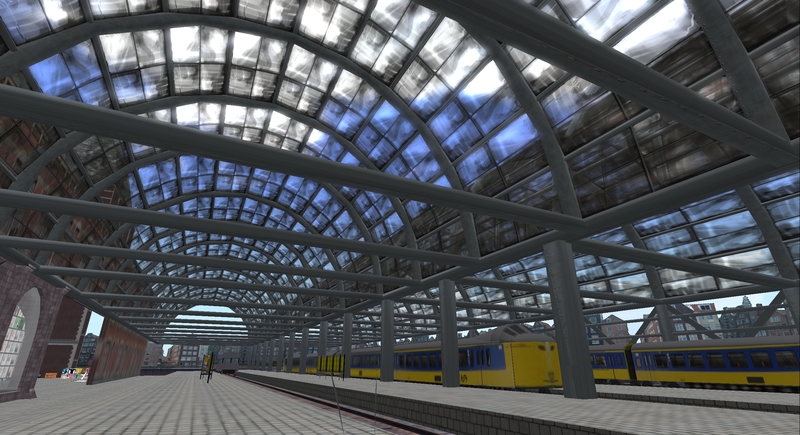 Your posts should be more than a simple description of your activity in SL. You need to reflect on what you are seeing around you; what you feel about the experience; and what you are learning. Look at Rory and Paige’s blogs for good examples. After class 8 your blogs will be assessed again so make sure to get them up to date. Write the eighth post: to your blog describing progress on your project. Prof Dudley Turner, University of Akron in Ohio, visited class this week. He invited us to drop by Akron Island (see links at right) anytime and also offered his help to students on their projects. If you haven’t already made friends with Dudley look out for him when you next log into SL. Class opened with a discussion around the reading material from last week, Reinventing Ourselves. Despite the fact that it is quite a dense and academic text it revealed the importance of understanding how identity is formed both in Real Life and online. Many of you needed to read through it a few times to get an understanding of the philosophical and psychological issues underlying this complex process. It also demonstrated to you the seriousness with which these matters are taken and how much is at stake. The discussion informed your feedback on progress in your projects. 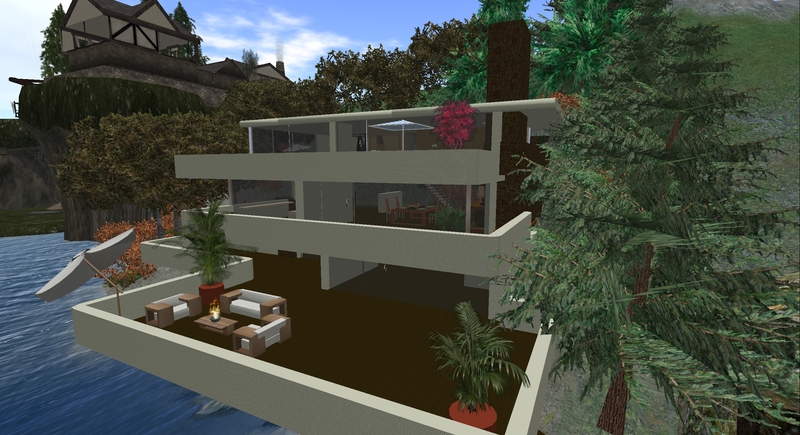 Everyone has been exploring SL for interesting buildings and trying to meet the owners and builders. The latter is proving less simple than it sounds and you report having come up against time zone differences, e.g., arriving in deserted cities because (despite the 4 time zones) everyone in North America is sleeping or working! Or being unable to establish contact with people, sometimes even when their avatar is standing in front of you. 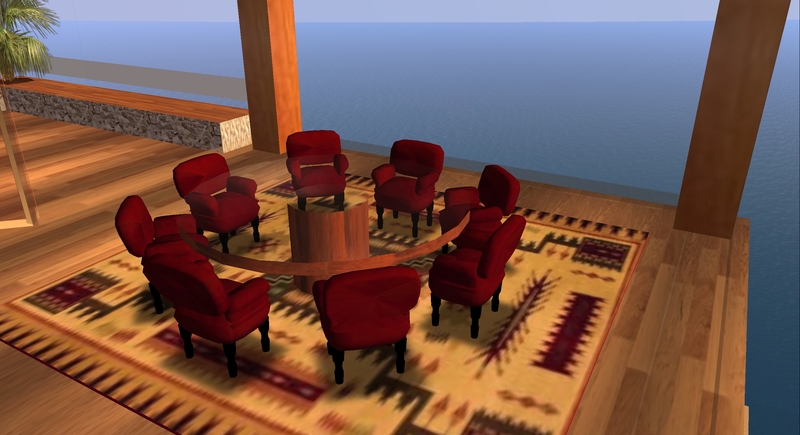 We talked about strategies for engaging with individuals you meet in SL: understanding what avatars in SL might be doing; the difference between Instant Messaging (IM) and local chat; contextualising your request. So, when you meet someone online the normal human cues that allow you to decide when and how to introduce yourself are not available. You need to keep in mind that people may well be engaged in different conversations that you cannot see. Trying to engage them in conversation may not succeed therefore you need to leave a message that they can see at a more convenient time. When doing so it is important that the message gives the full context of your request: who you are, what you are asking for; why you are asking this particular person; how can they contact you. This approach should be used in any form of online communication. John also reminded you to read the project brief and the assessment requirements thoroughly so you understand precisely what to do. He said that although you are working on a group project you will be assessed individually based on your discussion of the project during class, your blog posts about your contribution to the project and your role in the final presentation at the end of the semester. Finally, John spoke about writing posts to your blog. A summary of his advice can be read in a post to this blog from last year and would be useful for you to read now. Read: about the Impact of Technology on Disaster Relief and the History and Power of Hashtags and Five Brilliant Ways to Use Hashtags. Write the seventh post: to your blog describing progress on your project. For some reason attendance at class this week was very poor. This made it difficult to have a really meaningful discussion. However, Rory made up for it by sharing his experience of co-creating a successful automotive blog over the last five years. He shared the story behind the development as a few friends went from posting photos about their common interest to becoming a recognised source of expertise with several hundred followers. We discussed how this led to more focussed sense of responsibility towards the community of followers and greater sensitivity around the audience. Issues of copyright and plagiarism emerged also. The value of having a recognisable approach to the subject is one way of counteracting this – Rory suggested that the source of distinctive images remains recognisable even if cropped or altered. 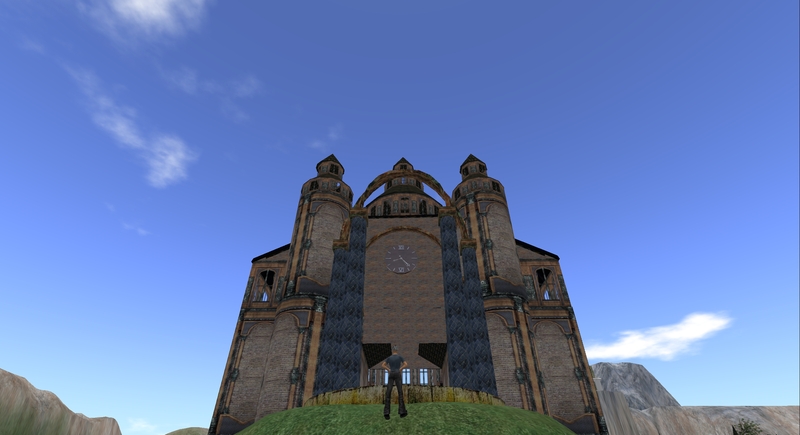 Review of three locations visited in SL. Description of encounters with two residents of SL. Three adjectives describing yourself and a 30 second elevator pitch. How to convert your personal presence online to an identity for professional networking. From this week on you should write at least one post a week describing progress on your project: how you are communicating with your partner, the tools you find useful, how easy/difficult you are finding online collaboration, what works for you and what doesn’t, etc. Read: some of Reinventing Ourselves: Contemporary Concepts of Identity in Virtual Worlds, Eds Anna Peachy and Mark Childs, published by Springer 2011. Prepare: a report on your progress with the project for next week’s class. Write the sixth post: to your blog describing progress on your project. If you have some time visit The Garden Maze at Falconmoon and see if you can find your way to the middle! the type of people who visit, own or use the building; etc etc. whether or not it is considered a success by its owner, builder, users, neighbours etc. The presentation should also give the audience a flavour of the building. The presentation can be made in or near the building or in any other appropriate venue selected by the group/pair. It should last between 5 and 10 minutes. Presentation date is normal class time on Thursday 10th December. Each participant should also describe the progress of the project in a weekly blog post. Discuss the details of the project and also the issues that arise in working collaboratively online. How easy is it meet up virtually and plan the project? What difficulties arise in development? How easy or difficult is communication? What particular problems arise and how do you deal with them? Participants present their ‘elevator pitches’ in class today. Most participants have now set up their blogs and sent links to us. John reminded you of the importance of posting something every week and ensuring, in particular, that you are keeping up with the posts specified for each week. That way you won’t have a panic at the end of the semester when all module submissions are required. To encourage this there is a assessment point this week and in week eight of the module. Final assessment will be made at the end. So, ensure you have sent us a link to your blog and that you keep it up to date. There was some discussion around privacy and it was agreed that you may keep the blog private if you wish – just don’t forget to invite John and Locks to have access. The class then continued the discussion about personal branding from last week. The reading informed your responses and it is clear that you all have an instinctive understanding of the nature of your online presence. It was generally agreed that we try to present the best sides of ourselves on Facebook. Many of you noticed, however, that when friends get jobs they become more aware of their social activity and often separate their Facebook identity by changing their names. This led to some consideration of the different platforms available online: LinkedIN for professional networking; Facebook and Instagram for social activities; Twitter for impromptu comment. We didn’t get around to looking at Google Plus or some of the more recent apps that allow people to remain anonymous, or delete posts after they have been read. The rise of public interaction promoted by Twitter and Facebook is now beginning to result in privacy having a premium. Have a look at the app Path which is very much like Facebook except that it guarantees only your own circle of contacts can see you. We took a break from the Media Centre and went downstairs to hear everyone’s elevator pitch. Although it can be difficult to sum up your personal life or personality in 30 seconds – particularly in a format more suited to pitching a simple idea – each of you put some considered thought into the process and presented very well. This led to a discussion of the appearance of your avatars in SL. Concern about the choice of female avatar costumes resulted in triplets in the class! John suggested using the meagre few L$ given to you at the start of the module to explore the shopping experience in SL to find alternative clothing – or indeed alternative avatars. Visit Redgrave for an extensive range of clothing for men and women. There are also plenty of places to find free clothing. Some of you have also raised this topic in your blogs and it is one to which we will return. In the meantime you might like to read about the Heron Sanctuary, an SL community for people with disabilities. Write the fifth post: to your blog about how you might convert your personal presence online into an identity for professional networking. We started the class by hearing from the participants about their experiences meeting new people in SL. It is quite a different experience from RL. Second Life is a platform specifically designed for interaction, communication and community building therefore it is acceptable to speak to nearby people/avatars, even complete strangers. For the most part they are willing to engage. Participants discovered that it was not as easy as it may sound to start conversations: do I use voice or text? I feel uncomfortable using voice; everyone is talking at the same time and it is not easy to distinguish one voice from another; mostly people respond with a greeting but don’t engage any further; it is difficult to break into a group of people who seem to know each other already… Nevertheless, some of you reported having interesting and engaging conversations and nobody experienced unpleasantness. We then went on to a discussion about online identity – informed by the articles, blogs and website links given here after the last classes. The imagery in Humans of New York provided an interesting opportunity to consider how we present ourselves. Participants talked about how you use Facebook and Instagram and how you perceive ‘friends’ in these spaces. However, it seems you don’t give much conscious thought to how you might be seen by others and how you present yourselves online. To develop this topic for the next class you should re-read the articles given in class 2. Keep the following questions in mind while you are reading. When I post to Facebook what impact am I trying to make? How would somebody who knows me only through Facebook recognise me from Instagram or any other platform? What criteria did I use in selecting my profile picture? When I am looking for a job what social media links will I include in my CV? Think: about three adjectives you would use to describe yourself. Prepare: an ‘elevator pitch‘ describing yourself in 30 seconds. You will present the pitch in class. Write the fourth post: on your blog describing the adjectives you selected and why; discuss how these traits influence your Facebook presence; and write your elevator pitch.